With a new iOS version and new iPhone hardware comes an updated version of iTunes. This week’s column covers a problem with missing podcasts in iTunes 11.1 and explains how to change the names of iTunes Radio stations. And because the best way to keep your iTunes library organized is to make sure your tags are correct—if they’re not consistent, you’ll have trouble finding music and other content when you want to play something—I also address a number of questions about tags. Q: I like iTunes Radio, but I was wondering if it’s possible to change the names of any of the iTunes Radio stations? You can’t change the names of the Featured Stations; these are the ones at the top of the iTunes Radio window that are programmed by Apple. But you can change the names of any stations that you created. If you create a station from a song with a long name, such as “Half-Step Mississippi Uptown Toodeloo,” you might want to shorten that name. To do this, click the radio station’s icon in the iTunes window to expand the view. Click the name, and you’ll see that it becomes highlighted. Type the name you want, and press Return. The new name will propagate to all your devices that are linked to your iTunes Store account. You can change the name of any iTunes Radio station just by clicking the name and entering a new one. Q: I have a large library of podcasts that I save to listen to again, but after I updated to iTunes 11.1, a lot of them were missing. Is there any way I can get them back? There have been a lot of issues with podcasts in the latest iTunes update. One of them involves podcasts that go missing. When I upgraded, some of my podcasts were visible, and others weren’t. I found that the podcasts were still on my Mac, but for some reason iTunes didn’t see them. If you have this problem, go to the iTunes folder in your home folder (the one with the house icon), open the iTunes Media folder, and then find the Podcasts folder. You can either drag this entire folder onto the iTunes window, or drag any of the subfolders it contains, named for specific podcasts that have gone missing. This should add all the missing podcasts to your Podcasts library. Q: I regularly transfer music from iTunes to a flash drive to play in my car. Some music transfers with artwork and some doesn’t. I’ve successfully downloaded artwork in iTunes for all of my music, but the artwork still does not display correctly. Is there any way I can fix this? 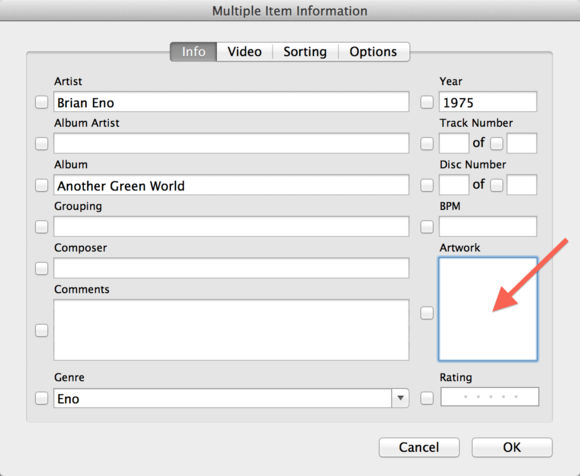 Album artwork can be stored in two ways in iTunes. It’s either embedded in files or stored in a cache folder, with iTunes displaying the artwork when you select or play a file. I suspect that the artwork that doesn’t display on your car stereo is stored in a cache folder, whether it’s artwork for music you downloaded from the iTunes Store or artwork you grabbed using iTunes’ Get Album Artwork feature. In either case, the artwork is not embedded in the files and therefore won’t display if you move the files anywhere else—to a flash drive or another computer. There are two ways to embed downloaded artwork in music files. For the first method, find an album whose artwork doesn’t transfer when you put its files on your flash drive. Select one track from that album, press Command-I, then click the Artwork tab. Click the artwork itself to select it, and then press Command-C to copy it. Click OK to close the window. Paste or drag album art into the Artwork well to embed them in your music files. Next, select all the tracks on the album, press Command-I, and then click the Info tab if it’s not visible. Click inside the Artwork well and press Command-V. You’ll see the artwork pasted into this well. Click OK to save the artwork to all the tracks. It will now be embedded in the files. There’s another way to do this using AppleScript. Doug Adams’s Embed Artwork AppleScript (donation requested) can automatically embed the artwork for a group of selected files. However, the script can’t handle more than about an album’s worth of tracks, but it’s still a bit faster than copying and pasting manually. Q: I work as an entertainer, and I use a music system called Media Star. This allows me to control my music from a remote control in my pocket when performing. In order to get my iTunes music on the Media Star system, which runs on Windows, I have to convert my iTunes files to MP3 files. But because of the tags embedded in the MP3 files, these files will not play on Media Star. Do you know any way of stripping tags from my files? Yes, there’s a free Mac app called Tag Stripper, by Mark Verstraete, that can do exactly what you want. It’s very simple: Just launch the app, drag your files into its window, then click Strip. You’ll see that the files retain their filenames—which you still need in order to identify your files—but all other tags get stripped out. Q: Can you please explain how iTunes uses the Album Artist tag versus the Artist tag? 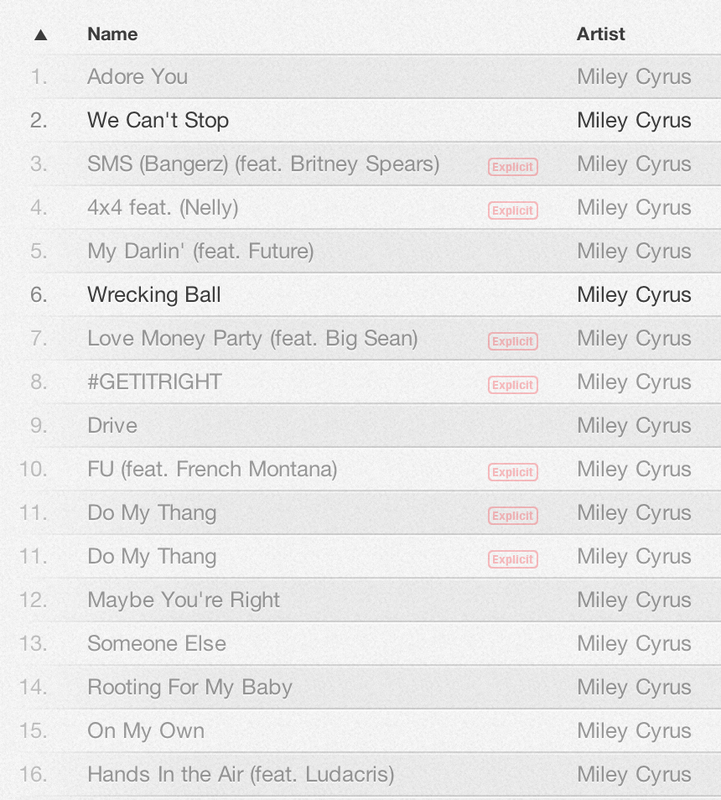 Miley Cyrus' forthcoming album has a lot of "featured" artists. Some music has a principal artist, plus others on certain tracks. 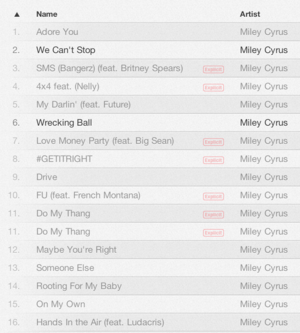 For example, Miley Cyrus’s forthcoming album (surprise, I actually know who she is!) has several songs with “featured” artists, as shown to the right. This is also the case in classical music, where there may be an artist—an orchestra and conductor—and additional artists on certain tracks, such as singers or soloists. In that case, you can put all the names in the Artist tag, and the name of the principal artist in the Album Artist tag. A given album could have a number of artists—take an opera, for example, which has different singers on different tracks—but the Album Artist name is constant. When iTunes displays music in, say, Albums or Artists view, it shows the Album Artist name next to the album name, and the individual artists (if any) below the track names. 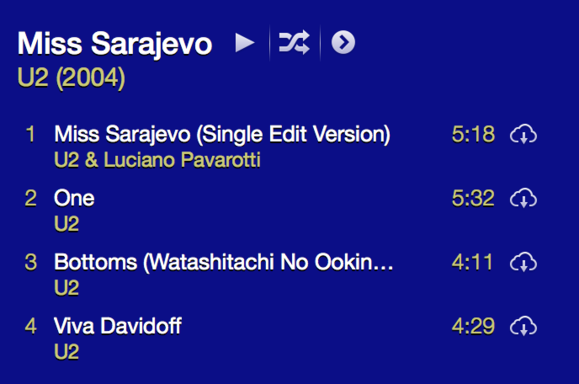 You can see that the track by U2 & Luciano Pavarotti stands out here. If all the artists are the same, no artists will display below track names in this view.